The Oregon Nurseries' Hall of Fame was established to honor and recognize individuals who have been instrumental in the development of the Oregon nursery industry, have brought credit and recognition to the industry or have had a profound historical impact on the industry. Portraits and biographies of Hall of Fame members are on permanent display in the J. Frank Schmidt Jr. Pavilion at the Oregon Garden in Silverton. Eight people — three couples and two individuals — were inducted into the Oregon Nurseries' Hall of Fame in 2019. 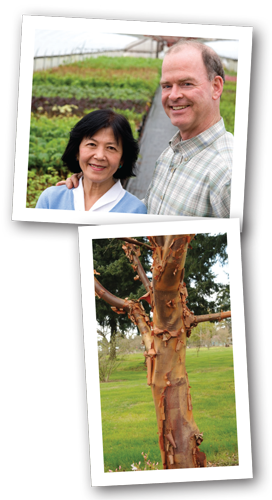 Art and Teri Iwasaki (deceased), founders of Tanasacres Nursery. Henderson Luelling (deceased), an 1847 nursery pioneer who brought seedlings to Oregon by wagon from Iowa. His brother, Seth, was inducted into HOF in 1999. Bob and Jean Fessler, founders of Woodburn Nursery & Azaleas Inc.
Mark and Jolly Krautmann, founders of Heritage Seedlings & Liners Inc.
Keith Warren, developer of new tree varieties for J. Frank Schmidt & Son Co. The Oregon Association of Nurseries thanks those who attended, as well as the sponsors and contributors who made it possible. We have photographs from the reception and the ceremony that you can view, download and share. In 1847, Henderson Luelling — never one to sit still — filled two wagons with charcoal, manure, earth and 1,000 grafted fruited trees, including apples, pears, plums, cherries, quinces and grapes. He and his family left Iowa heading west to settle in Oregon. In spite of everyone's advice that he would never make it across the Plains, Henderson, his entire family of eight children, pregnant wife, and 800 of the original 1,000 grafted fruit trees survived their journey on the Oregon Trail. The Luellings transported 60 varieties of plants, trees and vines in their traveling nursery, which would become the foundation of Oregon's thriving vineyards, orchards and nurseries. Luelling established his orchard on 100 acres in the community of Milwaukie, which is now the site of the Waverly Country Club along the Willamette River. Once Luelling was established, his extended family followed him to Oregon. In 1850, his younger brother, Seth Lewelling, 1999 inductee to the OAN Hall of Fame, moved to Luelling's Milwaukie-based nursery. (Henderson Leulling changed the spelling of his last name later in life to avoid scandal, but that's another story.) The younger Lewelling arrived from California with additional tree stock and seed and the two brothers, along with Luelling's son-in-law, began scaling their nursery business. Through tree grafting, Luelling's operation expanded to four growing locations and an estimated 100,000 trees in the ground. The first fruit from the orchard was picked in 1851. The population of Portland at time was 851 people, most of them apparently salivating for fresh fruit. Luelling sold his first trunkful at $1 per apple. In today's money, that would be $30 an apple. In 1857, Henderson and Seth, along with their head orchardist of Chinese descent, Ah Bing, grafted the still-popular Bing cherry. The cherry named in honor of Bing can trace its lineage to the first fruit trees planted in Oregon. Ultimately, Luelling's fruit trees became the parent stock of most of the orchards in Oregon's Willamette Valley. 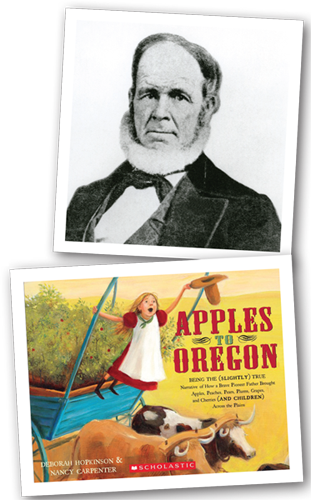 He is considered the father of the Pacific Northwest fruit industry. Luelling's family's migration to Oregon is just one part of the force of change in 19th century Oregon. Art and Teri Iwasaki started Tanasacres Nursery in 1978, but their story and history within the nursery industry started many years before. Art was born in Hillsboro, Oregon, where he grew up on the family farm along with his seven siblings. 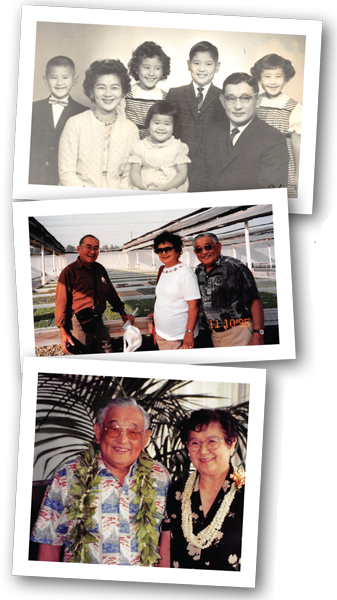 Art's dad enjoyed raising chrysanthemums and vegetable starts in greenhouses, later evolving into growing bedding plants and the formation of Iwasaki Brothers in 1916. Teri was born and raised a "city girl" in Portland, Oregon. She never thought she would marry a farmer, but it must have been Art's smile that won her over, and they were married on Easter Sunday in 1949. Horticulture was Art's life, and Teri soon developed a passion. Together they became active in the bedding plant industry, all while raising their five children on the family farm. Art became president and general manager of Iwasaki Brothers from 1954-1978. Currently run by Art's nephew Jim Iwasaki and his daughters, Iwasaki Brothers celebrated 100 years in 2016. 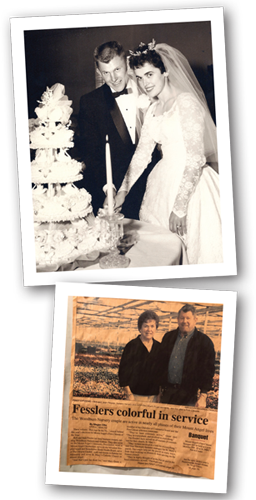 Art and Teri branched out on their own in 1978 to start Tanasacres Nursery; sons Paul and Bob and daughter Leslie joined them. And later in 1993 they built Max and Hildy's roadside stand into a full garden center. Art and Teri strongly believed in helping others, sharing information and resources within the industry. They were involved in many organizations including the Oregon Association of Nurserymen (OAN), Bedding Plants International, Washington Floral Association, International Plant Propagators Society and the Japanese Agricultural Trainee Program where they employed and sponsored Japanese youth to learn the nursery business. They were also instrumental in the formation of the Oregon Greenhouse Growers Association, along with other growers. Clayton Hannon, previous executive director of the OAN, courted the OGGA to become the OAN Greenhouse Chapter. In 1999 they retired and sold their business to their son, Bob. Staying true to their calling, they remained active in the nursery and community. Art focused his attention on remembering and educating the public of his wartime experience during World War II. He spoke at schools and was instrumental in constructing the Beaverton Veteran Memorial. In 2011, he and other members of the 442nd Regimental Combat Team were awarded the Congressional Gold Medal at the White House. In addition, Art was also awarded France's highest honor, the Legion of Honor, shortly after his death in 2016. The Iwasaki family would like to thank the OAN for honoring Art and Teri and the many people who enriched their lives. Growing up on family farms in the Willamette Valley, both Bob and Jean Fessler knew the value of hard work. After marrying in 1961, they started raising mink, cane berries and filberts. In 1968 they decided to try their hand at the nursery business. They started with a 25'x96' greenhouse growing florist azalea liners and worked side by side to build Woodburn Nursery & Azaleas Inc.
As they continued to grow the business, they decided in the early '70s to switch to dormant azaleas instead of liners. In 1979 they purchased Salem Nursery, a competitor in the dormant azaleas. The energy crisis in the late '70s caused them to drop the foliage and annuals and get into outdoor nursery stock. As the business grew, Jean devoted her time to the accounting side of the business while raising five children, and Bob continued to manage the growing and selling. Shortly thereafter, their son Tom joined the family business full time and worked in production on the nursery stock. Several years later their son Rick came on board to work with Bob on azalea production and daughters Karen, Sandy, and Jodi joined the accounting and human resource departments. Bob and Jean mentored their children so well that they eventually worked themselves out of their jobs. Continuously looking for better ways to produce plants, Bob was open to trying new and innovative ideas to improve the business, and always with Jean's full support. He received the OAN Pat Richardson Memorial Award for Innovation in 1998 and OAN Honorary Life Membership in 2011. Celebrating the company's 50th anniversary in 2018, the nursery now includes more than 200 employees and consists of 116 acres of covered production area, 56 of which is for azalea production and the balance for nursery stock production. The nursery stock includes 65 acres of can yard and 220 acres for pot-in-pot production. Bob firmly believes in growing a quality product that can sell itself. Volunteering is an important part of their lives and a value they passed on to their extended family. They have been generous in giving back to the communities that have supported them over the years includes their local church, schools and community life. When others are in need — Bob and Jean are there to help. Farming is still in their blood, and they continue to increase the farming side of the business. Bob has always pushed the thought of being diversified, to smooth the ups and downs of agriculture production. Currently they are semi-retired but continue to provide valuable input in the direction of their growing company. Mark and Jolly Krautmann started Heritage Seedlings & Liners Inc. in 1982 on five rented acres and a plan to propagate unusual woody plants in wholesale quantities. Starting with Japanese maple seedlings and using only hand tools for all the work, now they are growing over 520 kinds of rare and unusual woody plants. Mark and Jolly Krautmann met in graduate school at Texas A&M in the fall of 1975. Mark studied soil microbiology and Jolly, soil chemistry. Upon finishing their degrees, they moved to Oregon in 1978. Mark started work for a grass seed company and later commuted to Portland to West Oregon Nursery. Jolly worked in mushroom research for Castle & Cooke Company in Salem, then took computer classes at Chemeketa Community College which led her to become a computer programmer and systems analyst for SAIF Corporation. With Jolly's new solid income and benefits, Mark was able to quit his Portland job to start their nursery endeavor full time. After five years, Jolly was also able to quit her job to work on the nursery's first inventory and invoicing program. Mark and Jolly started growing only seedlings. Over the years production expanded to grafting, soft- and hardwood cuttings and growing on tissue-cultured plants. They were meticulous and Mark would continuously clean seed year-round in their home kitchen (aka seed laboratory) scarifying them with concentrated acid. Their two kids, Jonathan and Joan Claire, would have to dodge seed drying on the floor most of the year, and Jolly would endure sharing the kitchen with seed hidden under towels to dry slowly. Occasionally she would inadvertently pick up a towel throwing seed all over the house. Despite the hard work they persistently focused on the same rare and unusual product line. Literally creating new markets for their unusual ornamental liners. They took ambitious efforts to market their plants both domestically and overseas. Their export sales to Asia and Europe entailed up to 27 percent of their production in the late '90s when markets were anxious to get American native trees. Mark, Jolly and Heritage Seedlings are widely recognized for some of the most extensive private-property conservation efforts in the Pacific Northwest, and their stewardship ethic that permeates their company culture and natural resources care. In recent years, with help from Lynda Boyer, they also produce native Oregon wildflowers for seed — about 75 kinds that are used for oak savannah restoration and stewardship efforts in the Willamette Valley. Mark has been an avid volunteer on numerous industry advisory committees and boards including the Oregon State Weed Board and serving as the OAN President in 2003–2004. Keith Warren graduated from Willamette University in 1972 with a degree in English and minoring in biology and went on to the University of Washington to earn a degree in botany in 1973. In the summer of 1974, Keith began working for J. Frank Schmidt & Son Co., working in inventory, field work, and attempting to drive a tractor. Later that year he was promoted to production manager at the Schmidts' Canby farm. The Seattle city boy who loved plants but had never farmed before was suddenly on his own to figure out how to run a 375-acre farm with a half million trees. He listened and learned from the workers and was guided by periodic visits from Frank Schmidt Jr. and Frank Schmidt III. He quickly accelerated the quality and efficiency of the farm and within four years, the farm's tree numbers doubled, labor rates became the lowest and grade out rates the highest of all the company's farms. He was soon promoted to horticulturist for the Schmidt company and moved to the main office. Softwood cutting propagation for deciduous trees was just emerging from university research. Keith set up the company's first greenhouses and initiated the softwood cutting techniques. A couple of years later, tissue culture of trees became a reality and Keith worked with labs to establish cultures and incorporated these in production. Most of Keith's work as horticulturist involved controlled research to improve tree culture, growth and quality. Through experimentation, he developed new fertilization, pest and weed control programs, and pruning techniques to improve crops which he organized into manuals to guide production. Increasingly, his efforts turned to breeding and development of new tree cultivars. Growing out thousands of seedlings from hybridization and selected seed lots, as well as carefully examining seedlings in normal nursery production, he made hundreds of selections in many species. These were evaluated and tested, with the best going into experimental blocks for further work. By repeated selection and culling, the very best emerged to warrant introduction which Keith would patent and/or trademark. To date, Keith is credited with bringing 87 new tree cultivars to commercial introduction, which includes 37 patented or trademarked trees. Redpointe and Armstrong Gold maples, Royal Raindrops crabapple, and Emerald City tuliptree are some of the best known. Retiring in the fall of 2014, Keith continues to consult with Schmidt's, steering additional cultivars from his program to nursery introduction. In addition, he has partnered with Michael Dirr to co-author a new, state-of-the-industry book published by Timber Press, The Tree Book: Superior Selections for Landscapes, Streetscapes and Gardens.